Nearly four years after a major tsunami created the massive tidal wave that destroyed much of Japan’s Fukushima nuclear power complex in the northern part of the country, spewing radioactive waste into the air and surrounding Pacific Ocean, the truth about the after-effects of that disaster continue to reside in the shadows. For example, one of the most under-reported stories of all pertaining to the disaster — and one that should be of particular interest to Americans — is the fate of a number of crewmembers aboard the USS Ronald Reagan, the U.S. Navy carrier sent to assist Japanese military and civilian authorities in the immediate aftermath of the quake. According to German magazine Der Spiegel, the Reagan had been dispatched to the Fukushima site the day of the disaster, March 11, 2011, and the massive warship with its 4,500 officers and crew reached the area the next day, anchoring just north of Sendai, where it remained on station for several weeks. Under the mission codename of “Tomodachi,” which means, “friends,” the warship and its crew provided relief and assistance, as Japanese authorities and military units struggled to contain fires and radioactive waste. In the end, four of the six Tokyo Electric Power Company-owned reactors were damaged, three heavily, and ground crews worked feverishly to keep exposed reactor cores cool enough to prevent massive explosions. At the time Japanese (and American) officials assured the world that the crew of the Reagan, as well as the waters off Japan and the air above it, were “safe,” as in, there had not been an appreciable escape of radioactive waste, at least in amounts that would lead to long-term, permanent damage. Many aboard the Reagan bought into the government’s line. But now, as Der Spiegel notes, years later, more and more of the Reagan‘s crew has “mysteriously” become ill, including those like Master Chief Petty Officer Leticia Morales. On a host of medications and having undergone batteries of tests, she struggles to remember details about her everyday life. Three-and-a-half years later, Master Chief Petty Officer Leticia Morales is sitting in a cafe in a rundown department store north of Seattle and trying to remember the name of the doctor who removed her thyroid gland 10 months ago. Her partner Tiffany is sitting next to her fishing pills out of a large box and pushing them over to Morales. Once homeported at San Diego, the USS Reagan‘s homeport as of January 2014 is Yokosuka, Japan, ironically. It was Morales’ endocrinologist who asked her the question that made her start to wonder about Fukushima and about the “official line” regarding radiation exposure. He asked if she had been aboard the Reagan during Tomodachi, and she said she had. The endocrinologist then said he had also removed six thyroid glands from other sailors aboard the Reagan, and it was then that Morales put together her own poor health and her participation in the operation. Retired Navy Lt. Steve Simmons knows. He, too, has been suffering from illness since serving aboard the Reagan during Tomodachi. “There are individuals out there who are in very similar situations to myself… progressive muscle weakness that starts in their legs and starts to ascend. There are individuals out there who have developed different forms of cancer, leukemia, children of service members born with birth defects because of their service over there,” he said in a recent interview. 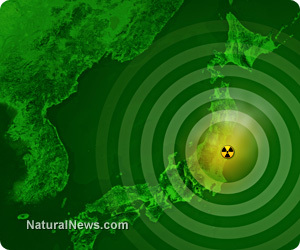 In a lawsuit filed against Tokyo Electric Power Company (TEPCO), the plaintiffs claim the power company delayed telling the U.S. Navy the tsunami had caused a nuclear meltdown, sending huge amounts of contaminated water into the sea and, ultimately, into the ship’s water system. The Daily Kos, citing a report from Al Jazeera, put the number of sailors sickened at 51.